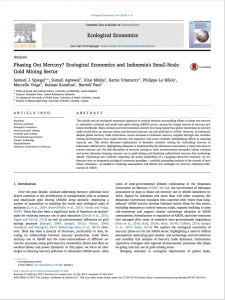 This article uses an ecological economics approach to analyse tensions surrounding efforts to phase out mercury in Indonesia’s artisanal and small-scale gold mining (ASGM) sector, among the largest sources of mercury pollution worldwide. CIRDI provided funding through Global Affairs Canada for this research report. Authors: Samuel J. Spiegel, Sumali Agrawal, Dino Mikha, Kartie Vitamerry, Philippe Le Billon, Marcello Veiga, Kulansi Konolius, Bardolf Paul.